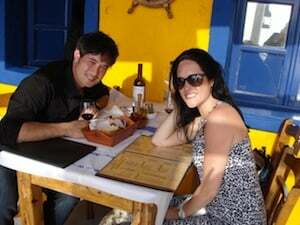 My husband and I got married on April 30, 2011 in California and left that weekend for 10 days to go island hopping in Greece. We both work extremely hard and never get to take vacations, so as excited as we were about getting married, we were even more excited about the incredible honeymoon we booked! We were in Greece from May 1-11 and had the most incredible trip. We chose this destination because I love beaches, fruity drinks, and great restaurants, while my husband has a deeper appreciation for the history, culture and all around learning experience of traveling. Island hopping in Greece was the perfect compromise! 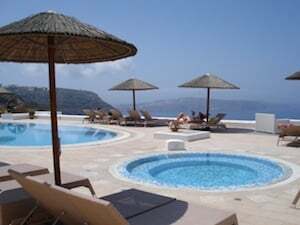 We started with three nights in Santorini, where we were able to stay in our own private villa overlooking the Santorini Caldera. It was absolutely breathtaking! We had a gorgeous bedroom, bathroom, and amazing living room in our suite. Our view was unbelievable and it was equipped with the most luxurious pool. The place was perfect. 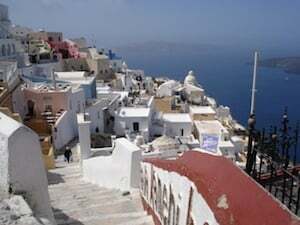 Also, we were close to Fira, the main town, and spent our days eating at top restaurants, shopping, wine tasting, and walking up and down the little streets talking to the locals. We then spent a day on a luxury yacht tour where they took us on a tour around the island to all of the different colored beaches (red, white, and black!). Eventually, we visited the caldera where we went swimming in the hot springs of the volcano and ended with a gourmet dinner cooked right on the yacht during sunset! 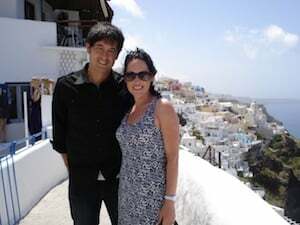 Just when we thought that day could not be beat, we spent our final day on the island (which happened to be my 30th birthday) in Oia, the most romantic and picturesque city in Greece. We spent the day enjoying the romantic views, little cafes, and ended our day at a little seaside town down the road called Ammoudia Bay. We ate fresh lobster and watched the sun go down in one of the best known places in the world to enjoy a sunset. I also got to blow out my birthday candles! Our next destination was Mykonos! We hopped on a high-speed ferry and headed to the island known for partying and beaches! We were pleased to find that our hotel there was also just as amazing as we had hoped. We had a gorgeous room with an amazing balcony overlooking the ocean. The hotel was stunning with amazing restaurants, a spa and a great pool bar scene. It was also right next to a great beach with sparkling clear blue water and food and drink service right to the beach chairs! We were in heaven. We spent our next three days in Mykonos exploring the world famous beaches, going to museums, finding hidden restaurants, driving a jeep around the island, and spending romantic nights having drinks and dinners in Little Venice. We also had an amazing spa day at the hotel which was absolutely a highlight for us! The whole Mykonos experience was incredible. Finally, we hopped on a plane and took the quick flight to Athens, where we spent our last couple of days. We stayed in a beautiful hotel that was right next to the Acropolis. It was so luxurious. With beautiful golden walls, it made you feel like you were staying in a palace in the heyday of Ancient Greece. We were within walking distance to the Plaka, which was a great little area of town filled with shopping, restaurants and entertainment. We ate street food, went shopping in the best areas, and tried to blend in with the locals! We spent a day exploring the ancient ruins, going to the Acropolis Museum, and walking through the Parthenon. We stood in places that epic battles had taken place and world history had changed. It was truly an amazing experience. That night we ate at the five-star restaurant overlooking the Acropolis on the rooftop of our hotel. It was some of the best food we have ever had. Our final night of our honeymoon we walked the streets of Athens, had an amazing Greek dinner, and watched Casablanca at a rooftop cinema with the Parthenon in the background. It was perfect! We selected our accommodations, activities, restaurants and experiences based on the fact that we knew that having a luxury honeymoon was a reality to us because of Traveler's Joy. From our meals, museums, our jeep rental, wine tasting, yacht day, drinks by the beach, massages, outdoor cinema, to my birthday lobster, we picked everything that was five-star and first class! The total cost of our honeymoon was around $10,000 and not a penny came out of our pockets. It was the perfect situation for us since we already had our home basics and didn't need a new set of china! We would absolutely recommend Greece to anyone that wants a honeymoon that will never get boring. It has something to do for absolutely anything you are in the mood for, whether you want to be active, relax, shop, drink, dance, eat, explore or learn, Greece has it all. We would have stayed another 10 days!